©2017 Zach Weinersmith and Kelly Weinersmith (P)2017 Audible, Inc. 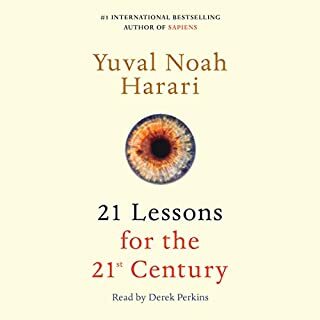 I really liked this audiobook. Her voice is clear and expresses well the tone of the book. The book is not really a story, but more of a descriptive prediction of the future. 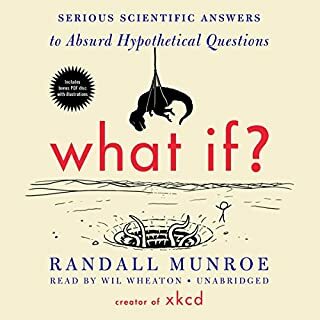 However, I think it would be better to read and listen this book at the same time because there are funny cartoons throughout the book, that are completely missing in the audiobook format. There is absolutely nothing to dislike about this book. The content, as complex and confounding as it is, was easy to understand and it really got me thinking. The presentation, masterful. I love and share your sense of humor and will hold up with you during the uprising in 2027 (perhaps in a coffee shop in Bowling Green). If my science classes were taught by Zach & Kelly I would have had a much greater understanding of all things science and probably be continuing Einsteins work today. Footnote: It’s my opinion and I have a right to it! 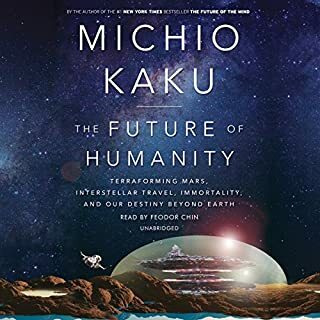 This book does a great job of walking through the technology trends of the current age, diving in to the consequences without getting as deep into it as Homo Deus: A Brief History of Tomorrow. The book is technically sound, interesting, well-written, and funny. Fair warning: As an audiobook, you'll hear "footnote" a lot during the performance. You'll probably get used to it, but if you can't get past the steady interruption you'll be annoyed. The concepts in this book were very easy to follow. The only thing I found annoying were the persistent footnotes that interrupted the flow of the book. I guess these are to be expected with this type of content. Which character – as performed by Kelly Weinersmith and Zach Weinersmith – was your favorite? Both Kelly and Zach performed great. I wish we could have heard more of Zach though. 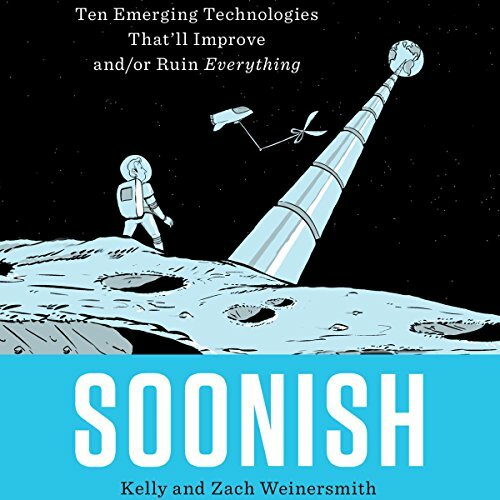 Did Soonish inspire you to do anything? Soonish did not inspire me to do anything, or dive deeper into the rabbit hole[s]. It just was fun and entertaining. Addition comments/suggestions - Way less footnotes. Unlike some reviewers I have not heard of Zach and Kelly before this but I thought they did a great job with this book! It covered a breadth of scientific topics and explained things exceptionally well. Depending on your knowledge, some sections will probably be a little more rudimentary than others. While I appreciated the light hearted approach to subjects covered, I honestly didn’t find their jokes funny, they fell flat on most occasions. If you look at the goodreads reviews you’ll realize I’m not the only one who thought this. However, this didn’t take away from the book (most of the time) because they were superb at keeping the subject matter fascinating and I learned a lot and think most people who read this will too! 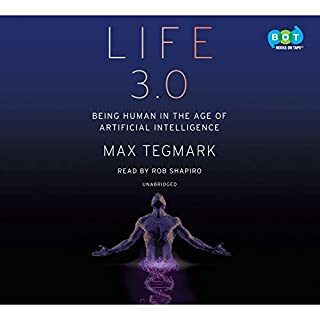 Audible vs the print version? While I love listening to audiobooks sometimes I do feel books are better as print. I thought this would be one of them due to the comics. However, I don’t think you need this book in the print as the comics are few and far between. Plus Kelly (narrates most of the book) does a great job! Well worth your credit. Foot Note . . . Hell, Oh God, Damn it, Dumbass! This book had a humor level that would have been great for my nine-year old, science loving son. The language, though not too offensive, was riddled with phrases that I'm trying to prevent from creeping into his vocabulary. For me that put it in an awkward space that reminded me of being read to by my sixth grade teacher only with mild swearing. Still, bits and pieces of the content are worth contemplating. 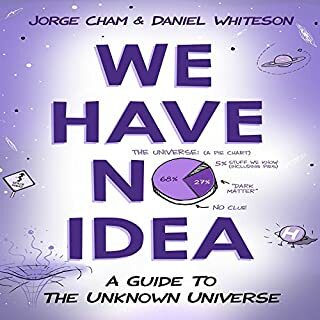 This book is at least an order of magnitude more fascinating than funny, which is impressive because it is quite funny! I gained a much less clear, but much more nuanced and accurate idea of what four future holds. If a person likes new technology at all in any form, I highly recommend this book. The content is good and interesting and perhaps inspiring.... 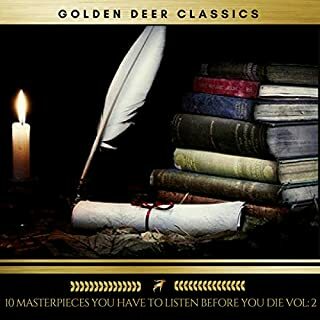 The author choose to read and I found hard to listen to. Listen to the sample recording before purchasing. I recommend the other co-author give it a go, or find a professional. The spacefaring and nanobot-material chapters were truly great. The biomass and organprinting chapters not so much. But I can see that is purely based on my personal interest, so shouldn't hold you back. I liked the structure of the book. All the chapters are sort of standalone, which made for an easy to understand book. I found the humor to be too much though. They try hard to make subjects more exciting by joking a lot. But for their audience (nerdy popular science people), they should've known that rocket science doesn't need jokes. Nerds don't find rocket science boring! Also, I think they should have hired a professional narrator for recording it. It shows that narrating is not for everyone. Had I known this was going to be someones debut as a comic I would have skipped over it. Really disappointed.